I'm looking for my printer which is a HP LaserJet 1018 and would like a black cartridge for this printer if you have one in stock? Thank you. Have you a good, and inexpensive, alternative cartridge to the original HP C7115X toner please. Can you let me know today? It is our central belief to only deliver toners that are at the very best quality that are manufactured to work seamlessly in your laser printer. Shop at Cartridge Save for the huge range of discount laser toners for the LaserJet 1000 laser printer now available to buy! If you want a store with really good customer care together with the least expensive rates on HP laser toner cartridges, then clearly Cartridge Save is going to be your chosen supplier. Right now at Cartridge Save you'll get the bonus of free next day delivery on each and every purchase, whatever you've spent. We take great pride in that 98% of all purchases will arrive the following day. You'll have total peace of mind if you order from Cartridge Save thanks to our cast-iron money-back promise. Should you encounter any difficulties printing with your HP 1000 toner inside 30 days after buying you can just easily mail it back for your full money back. Buy the highest quality toners at a less expensive price only on Cartridge Save. HP LaserJet 1000 is one of the most popular printers used to print a wide variety of documents. The HP LaserJet 1000 toner printer has a printing speed of about 8 pages per minute while its resolution is 1,200 dpi. It is a light weight monochrome printer with dimensions of 37 cm x 23 cm x 20.8 cm in terms of its width, depth and height respectively. Its paper tray handles about 160 sheets of paper and other media types such as envelops, labels, transparencies, cards and postcards. The HP 1000 toner printer has a sleek and small design, making it ideal for students and home use where it will use up less space. The printer's media feeder is designed in such a way to allow it to easily handle about 7,000 pages on a monthly basis. It can print both colour and black and white documents at speeds of 8 pages per minute. It also has a print quality of up to 600 dpi while its scanning resolution is 1,200 dpi. The design of the printer is simple since it only has two buttons; to start and cancel a print job. It also has a LED that shows if the printer is online. One of the main advantages is the large paper capacity, allowing the printer to handle up to 500 sheets and has a monthly turnover of about 35,000 pages, both greyscale and colour. The printer input tray contains a long media guide that ensures that media are fed correctly inside the printer. The HP 1000 toner printer prints high quality output of various documents ranging from plain papers, envelops, transparencies, labels as well as custom designed media. There are Hi-Speed 4 PIN USB 2.0 ports and a parallel port that makes it easy for peripheral devices to be connected to the printer. It is also compatible with various operating systems such as Windows and Mac. The HP 1000 toner printer has a slot for memory cards and can handle various cards such as Sony Memory Stick, Secure Digital/Multimedia Card and Smartmedia among others. 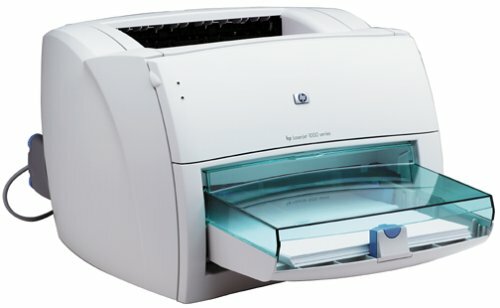 Regardless of all its benefits one of the limitations of the HP LaserJet 1000 is that it is designed with few controls. Since it has only two buttons, it becomes difficult to control other operations. It also has only 16MB and this is not enough for people who handle tons of projects.